I think art is important & I want to expose my kids to it as much as possible. However, bringing a toddler like Bronte into a place like the Vancouver Art Gallery is a bit nerve wracking--I'd spend the entire time telling her what she can't do. She's just not able to stand back & look yet, nor is her attention span long enough to merit the price of admission. Which is why I love the public art pieces all over this city. Public art is designed to be essentially kid-proof. Bronte can crawl on it or through it. 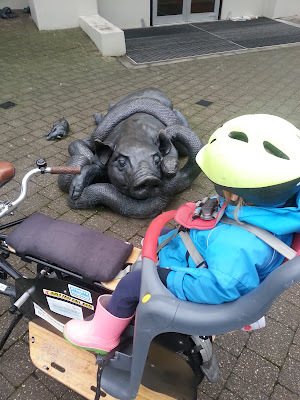 We pass by so many of the pieces on our travels along the bikeways, seawall, & around places like library branches. The kids get to see it every day & have 'bite-sized' interactions with art, instead of trying to spend a couple hours at a time in a gallery. Yesterday morning, Bronte had a little chat with this pig & his snake friend outside the Kensington branch of the Vancouver Public Library while I popped a few things in the book return. There are actually quite a few brass animal sculptures in funny combinations on the sidewalk all around the library near Knight & Kingsway, including this large & many tiny pigs. I love being able to zip up onto the sidewalk & park the Yuba Mundo on the centre stand right next to the art. It was just for a minute or two, but it's nice that B can easily interact with this sculpture while I'm doing a quick errand. If we had a car to do something like this, she'd probably be stuck in her rear-facing car seat, not able to see any of this at all. No wonder the poor kid doesn't really like being in the car! What's your favourite public art piece in the city?